I'm a homeowner not an HVAC pro. Hopefully I'm not breaking the rules by posting a question. I moved my electric dryer to a different spot in the house. I vented the dryer through an existing unused vent. The vent is located very close to the furnace air intake. The clearance between the vent and the air intake is about 1 foot. I know they should be at least 3 feet apart. This is a townhouse and the space is very tight. Moving the dryer vent is not a good option. I added a piece of pipe to move air intake exactly 3' away from the dryer vent. I didn't glue the pipe as I'm not sure if this configuration is okay. I'm concerned that furnace intake and exhaust are two far apart (almost 3'). I checked the install manual for my furnace (American Standard AUH2B060A9V3VA). The manual doesn't specify the maximum vertical clearance between intake/exhaust. But, the suggested configurations in the manual keep them fairly close together. I guess my main question is: Do you see any serious issues in the second picture? The installation manual wouldn't approve that type of termination. American Standard, in some cases, does allow downward venting, but with the termination you must snorkel up. I personally don't think you will have any operational problems with the extension you installed on the intake, but you could be red tagged in the future. 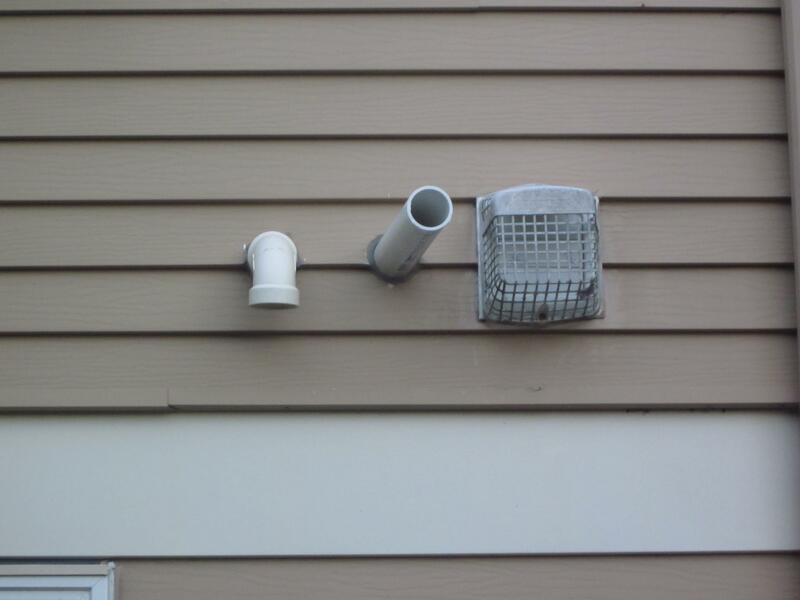 I would have extended the intake pipe horizontally so that it was 3' from the dryer vent. I can't find the installation manual to see if there's anything about horizontal separation. Lennox allows a 2' horizontal separation between the intake and exhaust pipes. The manual might say something like "Intake and exhaust terminations are not required to be in the same pressure zone." I attached a picture of how I would do it. Clause 8.3.7 came into effect on December 31, 2012. If the furnace was installed prior to that, then the new 3' rule cannot be enforced on your installation. I would remove the extension and leave the termination the way it was. Another option is to remove the furnace intake completely if the furnace is approved for non direct vent (1 pipe) installations. You would most likely have to install a 4" fresh air duct into the mechanical room. Maybe you could use the other dryer vent hole you abandoned. You could cut the intake vent about 12" above the furnace and install an elbow, then terminate the 4" fresh air duct 1' above it. Thank you, Admin. I appreciate the response. I like your suggestion to extend the intake pipe horizontally. The installation manual specifies 9" minimum horizontal separation. There is no maximum in the document I have. See page 20 in the attached pdf. I've seen manuals for other Trane/AS models that specify both the minimum and the maximum. I don't know why they didn't specify the maximum for my model. My furnace was installed in 2010. Good to know that 3' rule is not enforceable. I have one concern about leaving the termination the way it was. It's very likely that furnace intake pipe can draw some warm, humid air exhausted by the dryer. Can it cause operational issues in the furnace? There is also risk of lint getting sucked in the intake. We are careful to clean dryer filter before every load, but trace amounts of lint still escape outside. Non-direct venting is probably not a safe option in my case. I have an orphaned water heater venting through the chimney. The furnace and the dryer are close by in the same mechanical room. I would be very concerned about the back draft when all three go on at the same time. I'd rather keep the furnace vented directly. The room does have a 4" fresh air duct, but it's probably not enough to eliminate the risk of the back draft. I attached a picture of my house. 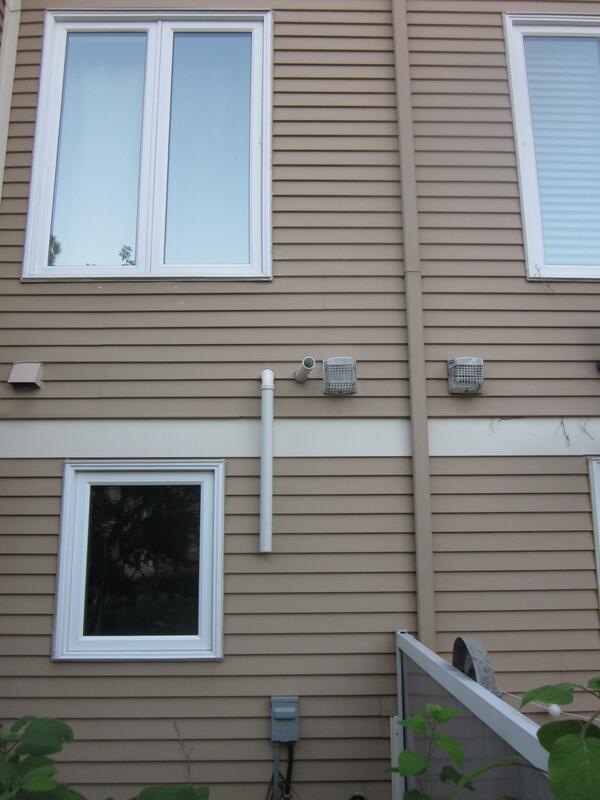 The builder installed a Amana direct vent furnace and a dryer vent within 3' of the furnace intake. The Amana intake does have a screen fitted into the end of the intake pipe, so it may offer some protection, but I have never seen any hair or lint around it. I usually don't like seeing any sort of a screen on a furnace intake vent, but mine has never caused a problem by icing up. I also clean my furnace yearly, and have never found any lint inside. It's likely the dryer would not be running at the same time as the furnace very often. I don't think there's any concern with the furnace intake pulling in warm or humid air, unless that warm and humid air would condense and ice up the intake pipe. The furnace's pressure switch would stop the furnace if that did happen. You could look at installing a secondary lint trap inside, close to the dryer, if lint did become a problem. In your case it's likely any lint would fall to the ground before it made its way into the intake pipe. I would use both appliances this winter and monitor the end of the intake pipe, for any signs of lint or ice build up. I would be very surprised if you had any problems. Sounds like I can leave my termination as it was before. That is easy. Thank you again for sharing your thoughts. Very helpful. The issue is sucking in lint. It may, or may not happen. Gaining the additional clearance by snorkeling down may not help as the lint always falls directly downward and can still get sucked in. I'd keep an eye on it at at both ends to make sure it isn't sucking in lint. If I was going to re-route it in any way, it would be the way the admin showed it in the diagram. I'd also tear off that caged exhaust vent as it's going to clog up with lint. It's not the proper vent for a dryer, and when I do come across them used in dryer situations, the lint is always built up and caught around the cage. That has the possibility of leading to a fire and much longer clothes drying times.